- return to the rugby jersey design previously worn in 1929﻿﻿. - return to the "Q" previously worn on the jumper front in 1930. - new jumper issued for the National Carnival in Hobart. - one of the most prominent and unique versions of the "Q" to be worn. A unique version of the "Q" not worn again. - a new version of the "Q" that was later used in 1963, 1970 and formed the basis of the QFL monogram worn 1975-79. - return to a rugby jersey. 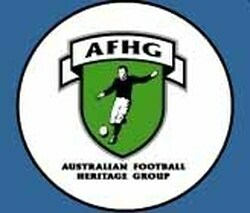 - white collar worn for the first time since 1947. 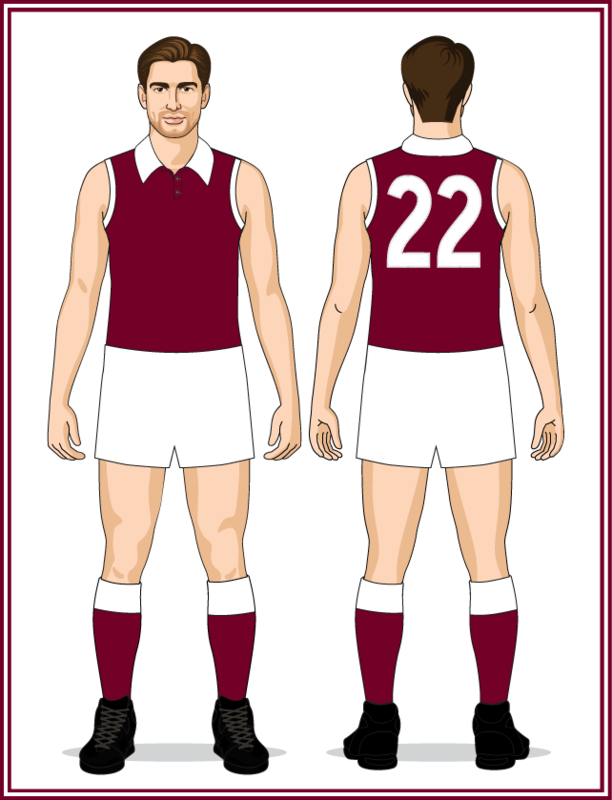 - first use of white cuffs on the long-sleeved Queensland jumper. - new version of the "Q". Return to the "Q" first worn 1950-1953. A new version of the "Q" that was the thinnest of any to appear on the jumper front. 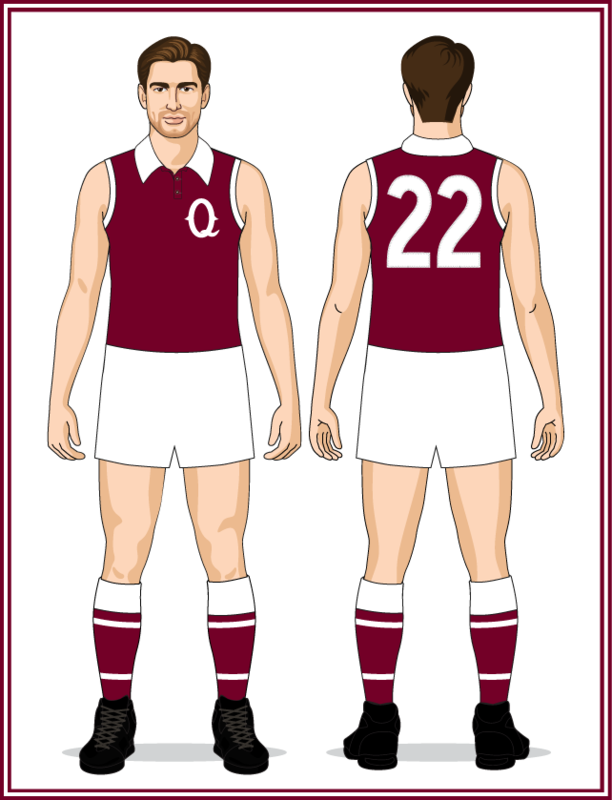 - sleeveless jumpers had become popular at club level during the 1960s, this Queensland State jumper joined the trend. - larger version of the 1950 "Q" but with the end of the stem flicking-upwards. - shorts changed to the tighter-fitting style popular throughout the 1970s-1980s. - new sock design featuring a thin white band top and bottom. 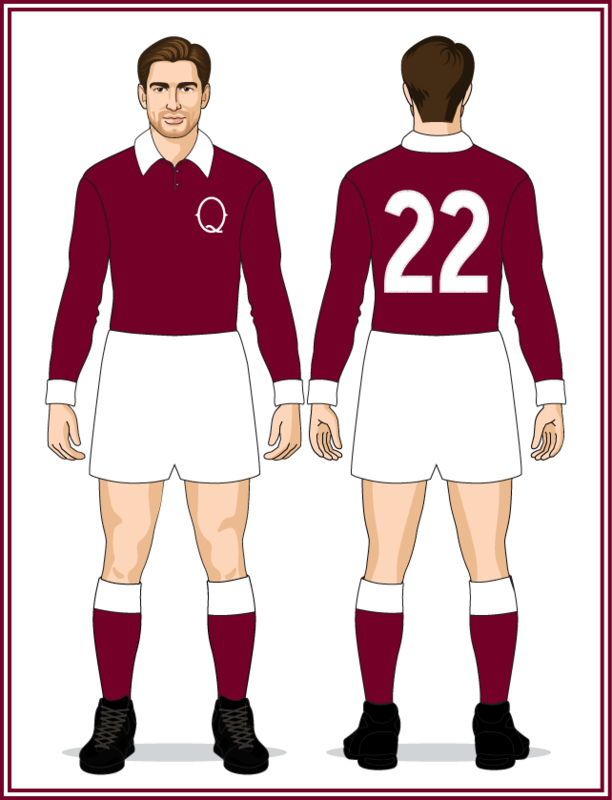 Sole difference from the 1970 uniform was the removal of the "Q" from the jumper front.